Washington Capitol Alex Ovechkin – 2009: Winner of the Maurice “Rocket” Richard Award (twice) and Calder Memorial and Art Ross Trophies; Leads the league in goals, points, plus/minus and shots; tied for third in takeaways and in hits; holds the Caps record for points in a playoff season and has the best plus/minus in Caps playoff history; an Olympian and now the cover athlete for 2K’s NHL 2K10. Not a bad list of achievements for a 23 year old from Moscow with only 4 years experience in the NHL. New York, NY – June 16, 2009 – 2K Sports announced today that Alex Ovechkin of the Washington Capitals, the 2009 Maurice “Rocket” Richard Award winner and Hart Memorial Trophy candidate, will be featured as the cover athlete and spokesman for the next iteration of the popular NHL 2K franchise, NHL® 2K10. While leading the National Hockey League (NHL) in goals scored for the second consecutive season, Ovechkin has become one of the most recognizable faces of the NHL in only his fourth season, and will bring his electrifying personality and unmatched passion for the game to NHL 2K10 this year. 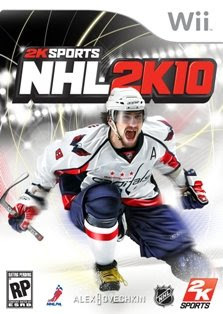 NHL 2K10 will be available this fall for Wii, Xbox 360, PlayStation 2 and PlayStation 3.